Mix oil, soy sauce and Steak Seasoning in small bowl. Place steak in large resealable plastic bag or glass dish. Add marinade; turn to coat well. Refrigerate 30 minutes or longer for extra flavor. Remove steak from marinade. Discard any remaining marinade. Grill over medium-high heat 6-8 minutes per side or until desired doneness. 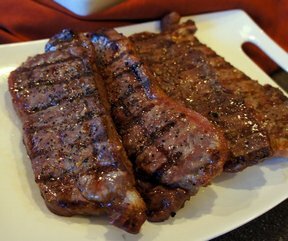 "I found some strip steaks on sale and grilled them using this recipe. Yum! I will never season my steaks with any other seasoning again!"